He has invited biggest celebrities from Bollywood and sports on his popular TV show but comedian Kapil Sharma now wishes to have politicians as guests on his new show, including Prime Minister Narendra Modi, whose story he finds “inspirational”. 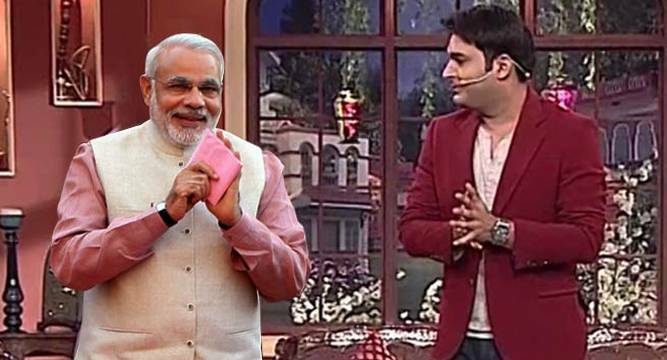 “I wish to have Mr Narendra Modi on our new show (‘The Kapil Sharma show’). I was watching television recently and saw Mr Barack Obama on Ellen’s show (on ‘The Ellen DeGeneres Show’) and it is great. We should also have politicians connecting to people,” Kapil said in an interview here. “If we have Mr Modi on the show we will not talk about politics, party and all. I would love to know how a man from a small town has come this far and became the PM of our country. It’s an inspirational story. I will try and talk to him,” he said. Kapil said he is happy that his previous show “Comedy Nights with Kapil”, aired on channel Colors, has ended as he is now getting the opportunity to try something novel. “I feel it is good that show got over as we got the opportunity to do something different as the characters were fixed. Now that we have a new show, everyone is excited. We are making a different show,” he said. Apparently, all was not well between Kapil and Colors. Gossip mills were also abuzz that Kapil as insecure with another comedian Krushna Abhishek’s show “Comedy Nights Bachao”, which also aired on the channel. Actor-comedian Krushna had said there is rivalry between him and Kapil. Kapil, however, cleared that though he had some differences with the channel, there was no friction between him and Krushna. “I had some issues with the channel some differences. We both (Krushna and I) did a show called ‘Comedy Circus’, together. There is nothing like that,” he said. “There is no rivalry. It is kiddish of him (Krushna) to talk like this. Earlier, Bollywood stars would hardly go on comedy shows to promote their films,” he said. “Comedy Nights with Kapil” became one of the most loved shows on television and Kapil feels it is time to give back to the audience something new and different through his show “The Kapil Sharma show”. “People have given so much love to our show that we feel it is our responsibility to give them something better. It’s great that the entire team - Ali Asgar, Sunil Grover, Kiku Sharda, Chandan, Sumona and Navjot Singh Sidhu are back together,” the “Kis Kisko Pyaar Karoon” actor said. The comedian-actor surely knows how to tickle the funny bone of the audience but one thing he promises is he would not subscribe to double meaning jokes. “My strength is stand up...I do gags...We are using our strengths. Like Sunil Grover works best in disguise. We are working on the characters,” he said. “The Kapil Sharma show” will air on Sony channel.